I don't know about anyone else, but I found last week to be really long, so the weekend was a welcome sight! This guy sitting on the couch on a Friday night watching his new favourite show "Paw Patrol". I had heard of this show before but had never seen it. It's pretty good, and it's made in Canada! We made elk burgers for supper. The elk was courtesy of Dave's uncle in Saskatchewan. Dave's parents went through there at Christmas time and brought us some elk sausages, elk roast and ground elk. The burgers were very tasty, especially with caramelized onions and gouda. On Saturday after swimming, we headed to Dave and E's favourite store, Home Depot. 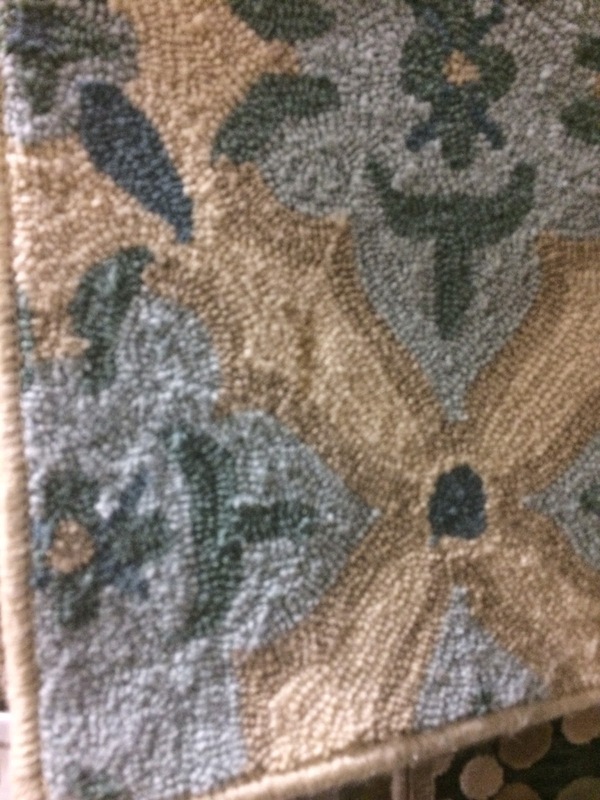 We only ended up with some caulking and dish soap, but we also checked out some rugs. I liked this for our living room. 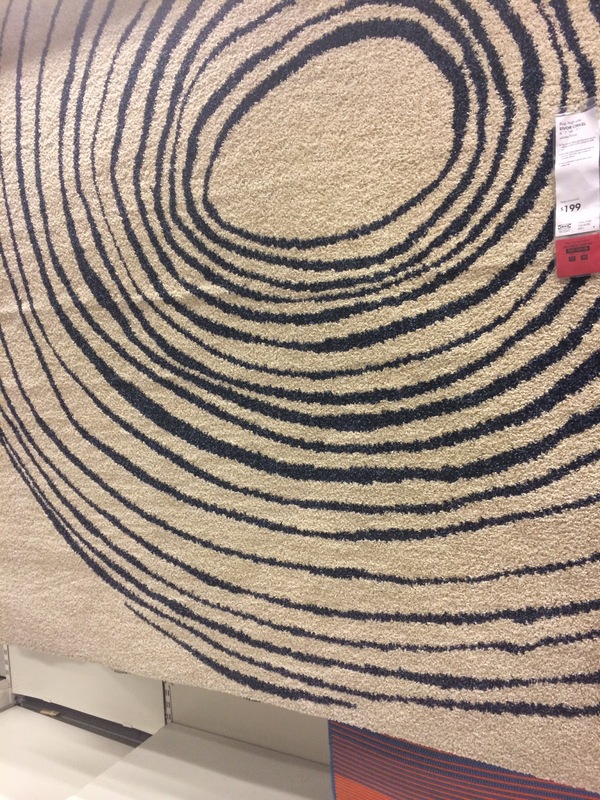 I like this pattern but not sure if I want a big version of it, maybe just in small mat size. 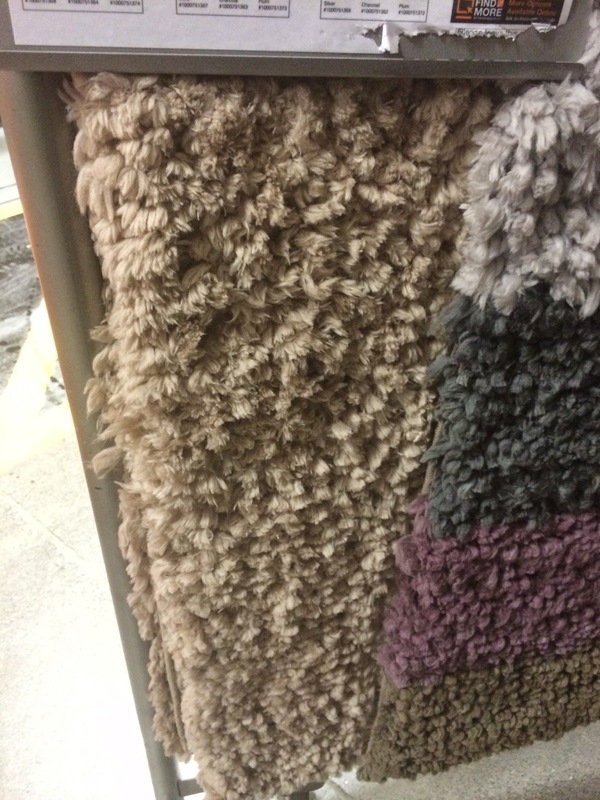 This fuzzy rug would be nice for our room. Then we went home for lunch and Dave did some caulking in the kitchen between the counter and backsplash. And I taped off mat sizes on the floor so I could see what works in the space. Then we went to Ikea (along with everyone else in Toronto). We did get a few things - a rug for E's room, shelf for above my dresser, and a couple of other things. 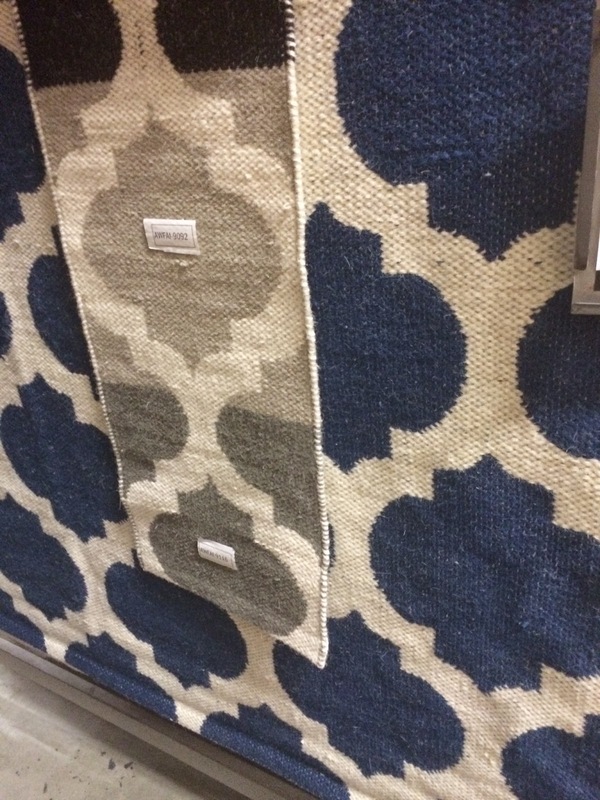 We liked this rug, not sure if it would work in our living room or if we want something more traditional. Of course the one I liked the best was outrageously priced, even for Ikea. 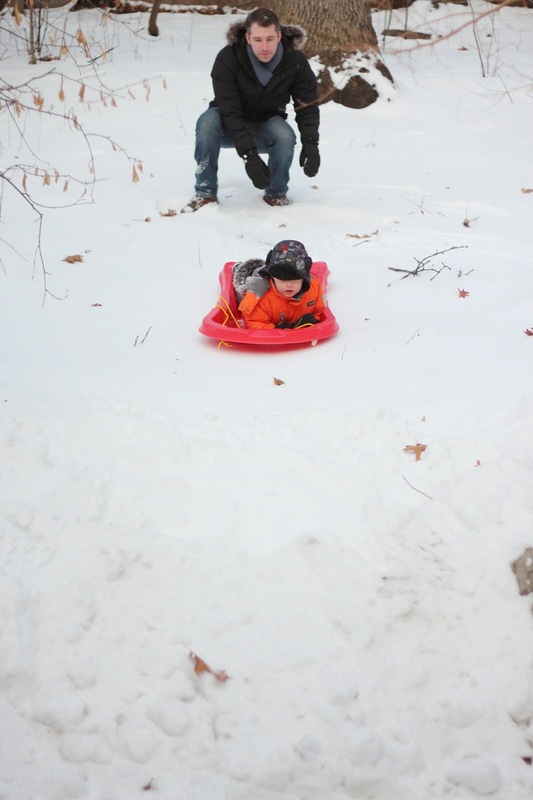 When we got home, Dave and E went out to play in the backyard, and they set up a sledding run. It is the perfect size for E, and with a few adjustments is quite safe. 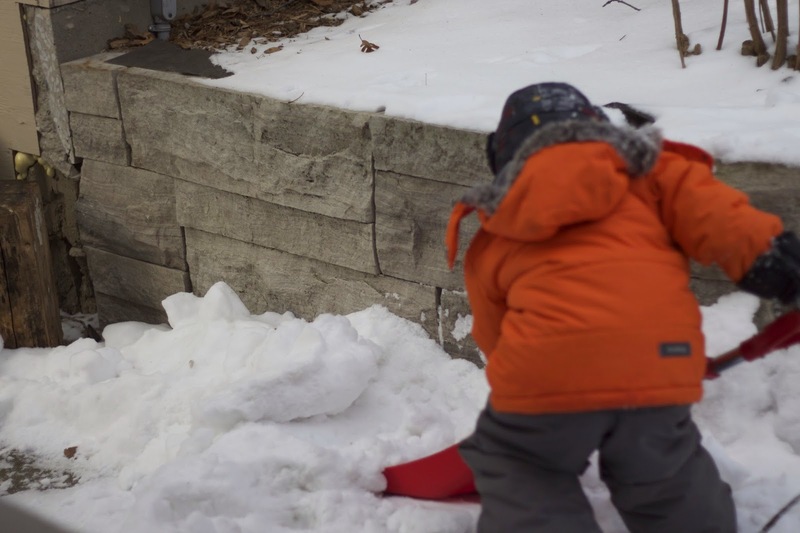 They covered the steps with lots of snow and made it a good angle, and then Dave made a barrier at the bottom of the hill so E would stop before he hit the cement step. We went out again on Sunday afternoon. 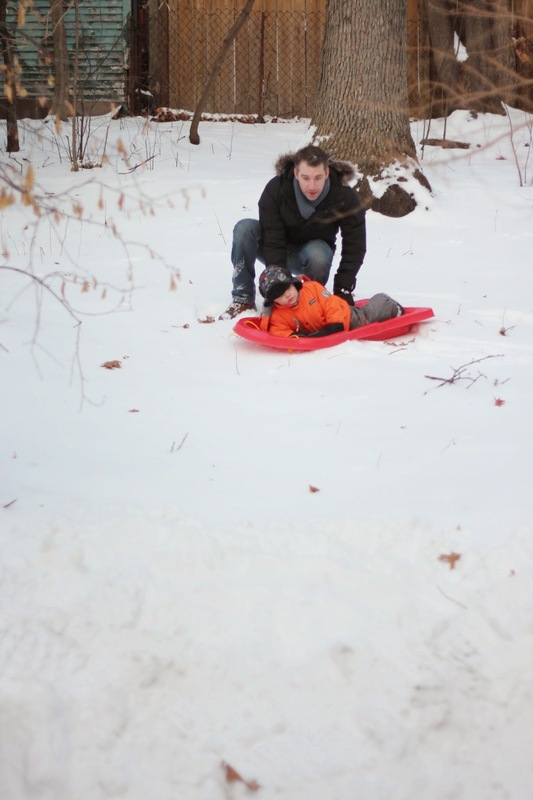 So nice to be able to sled in your own backyard plus you get to drink cold beer while playing. 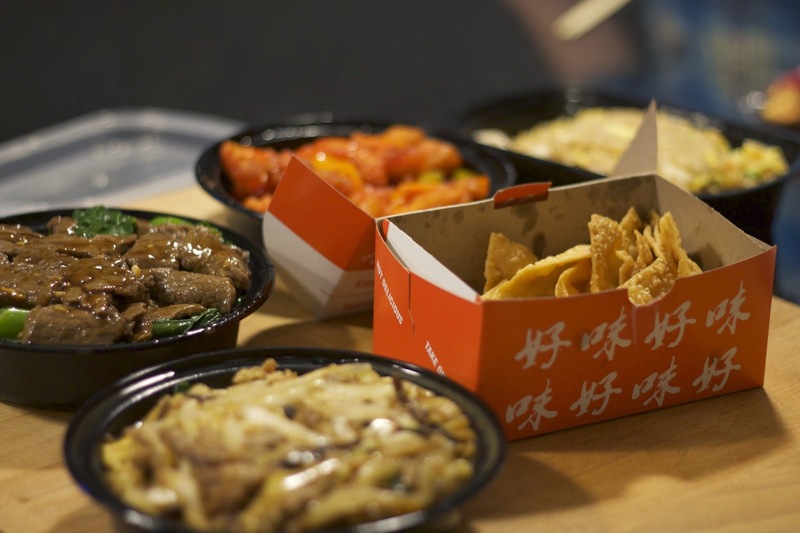 We ordered some yummy Chinese food on Saturday night. It was our first time ordering from this place and it was quite good. It is on our delivery list now. 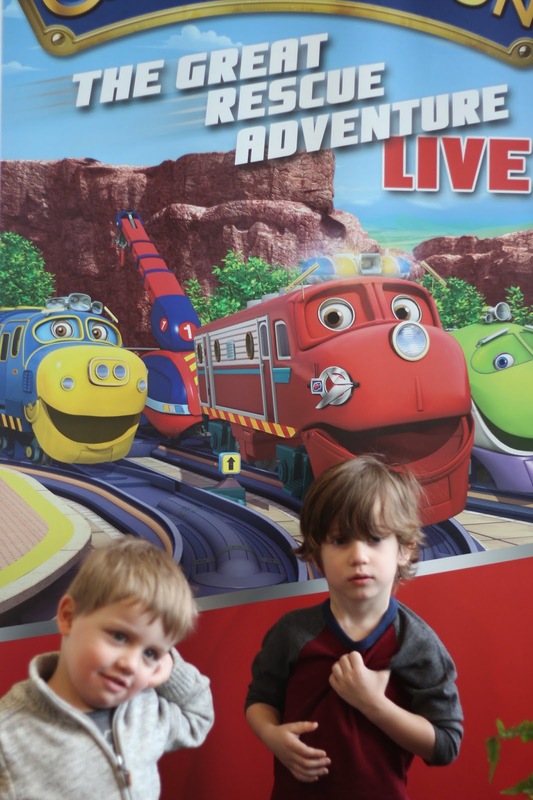 E and I went to church on Sunday morning and then headed out to see Chuggington at the Living Arts Centre in Mississauga. We met some friends there and we had a great time. 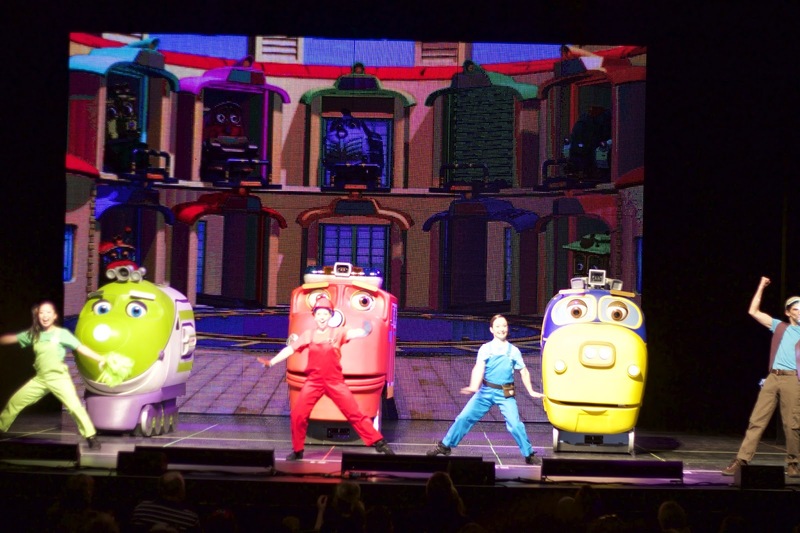 I was very impressed by the trains and how they moved around, the storyline was a little weak. The boys liked it though. E was not into posing for the picture. 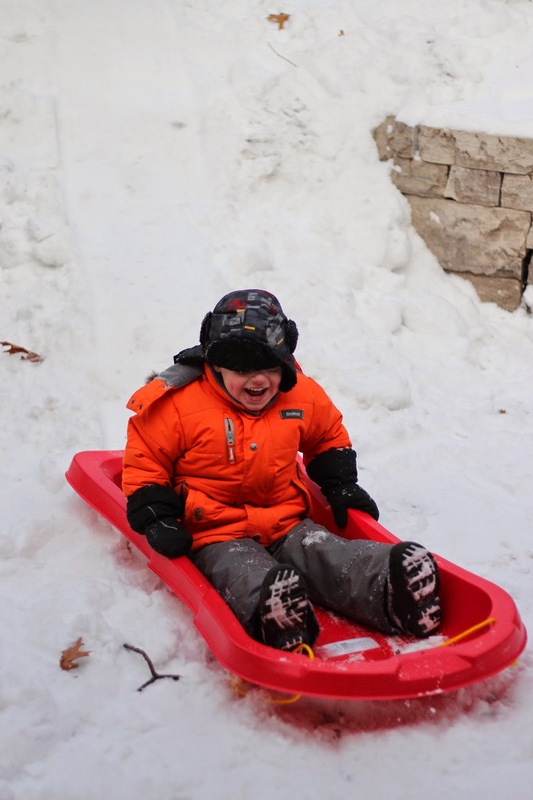 What great winter fun! And in your own backyard! Wow! I love Dave's comment about the chips and what the guys wouldn't say...after all it was the Super Bowl ! Tim is seriously obsessed with Paw Patrol. It is a bit ridiculous. Even Isabelle is getting annoyed with his obsession.